Is the Greenhouse gas effect (GHGE) basic physics? "basic physics" <-- I've been told this often. Here are 3 questions and 1 point asking for the science behind this "basic physics". 1. Is the carbon dioxide (CO2) greenhouse gas effect (GHGE) due to CO2 "trapping" heat? 2. Does GHGE warm earth by emitting less outgoing longwave radiation (OLR) to space? 3. What are the magnitudes of surface warming due to downwelling longwave infrared (LWIR) "forcing". Per material, especially, most especially, for water. Because water covers 71% of earth's surface, and LWIR penetrates mere micrometres into water. When, where, by whom were observations/experiments done, since 1978, to validate statements made about the GHGE? My point. Climate scientists measure the temperature of the atmosphere close to the land surface (about 1.5m above the surface). This is not the same as the actual surface temperature. On a sunny day, the surface is considerably warmer than the air above. At nighttime, the atmosphere above can often be warmer than the surface. Given that the rate of radiative cooling is proportional to the 4th power of temperature, by Stefan-Boltzmann Law, after 30 years of climate alarmism, and upto $100 billion funding for "The Science", why are climate scientists still not measuring the temperature of the surface which they claim to be "warming"? Re: Is the Greenhouse gas effect (GHGE) basic physics? My point. Climate scientists measure the temperature of the atmosphere close to the land surface (about 1.5m above the surface). This is not the same as the actual surface temperature. On a sunny day, the surface is considerably warmer than the air above. At nighttime, the atmosphere above can often be warmer than the surface. Climate scientists measure temperatures on the ground (https://www.sciencedirect.com/science/article/pii/S0034425705001562), in the atmosphere near the surface (https://www.acs.org/content/acs/en/climatescience/energybalance/earthtemperature.html ) and in the upper atmosphere (where temperatures are falling because the heat is trapped beneath them http://www.theclimateconsensus.com/content/satellite-data-show-a-cooling-trend-in-the-upper-atmosphere-so-much-for-global-warming-right), and temperatures of the ocean at the surface (http://www.argo.ucsd.edu/) and deep below the surface (https://www.scientificamerican.com/article/deep-ocean-waters-are-trapping-vast-stores-of-heat/). We can verify that it is because of greenhouse effect because the lower atmosphere is getting warmer and the upper atmosphere is getting colder-clearly there is a decrease in the rate that energy is getting from the surface to the top of the atmosphere--and these observations are very much consistent with the theory of the action of greenhouse gases. I will add: the GHGE is basic physics: decreasing the efficiency of energy flow out of a system while maintaining the efficiency of energy flow in must necessarily increase the energy inside the system at any given time. • Thermal energy, which as has been pointed out: the hotter the surface, the more effectively it radiates energy, so a new thermal equilibrium can be established, in which increased GHGE is compensated for by increased radiation of hotter surfaces (ie global warming). • Phase change (essentially thermal energy that doesn't influence temperature--aka latent heat): melting ice and vaporizing water can account for enormous amounts of energy (the latent heat of melting ice is about 330 kJ/kg and the latent heat of vaporizing water is a whopping 2.2 MJ/kg--luckily the vapor pressure of water doesn't change that much with increasing temperatures that are relevant to the climate (https://en.wikipedia.org/wiki/Vapour_pressure_of_water). This change of phase, especially melting ice, is particularly worrisome because it doesn't increase the temperature (which as discussed above, increases the rate of energy transfer out), and actually ends up increasing the net rate of energy absorption because ice and snow typically much more reflective than whatever they are on (ground or sea). (I will note that ice and snow are also very poor blackbody radiators compared to what they cover, but places where the ice is are not places where blackbody radiation is going to be a major player in temp regulation). Finally, melting land ice contributes to rising sea levels, which are likely to be one of the most expensive costs of climate change in the next 200 years. • Potential energy (mechanical) stored as increased pressure or net lifting of mass against gravity. This is a fairly small effect, but important nonetheless. Higher temperatures means more mass in the atmosphere--think of it as a tiny component of the latent heats discussed above). And then there are issues of biology, ecology, meterorology etc. that are very far from basic physics. "there is a decrease in the rate that energy is getting from the surface to the top of the atmosphere"
You did not actually say less OLR was being emitted to space, but you implied it. The research I've done shows that more OLR is emitted to space today than 33 years ago. Care to explain the paradox? Please see the attached chart. 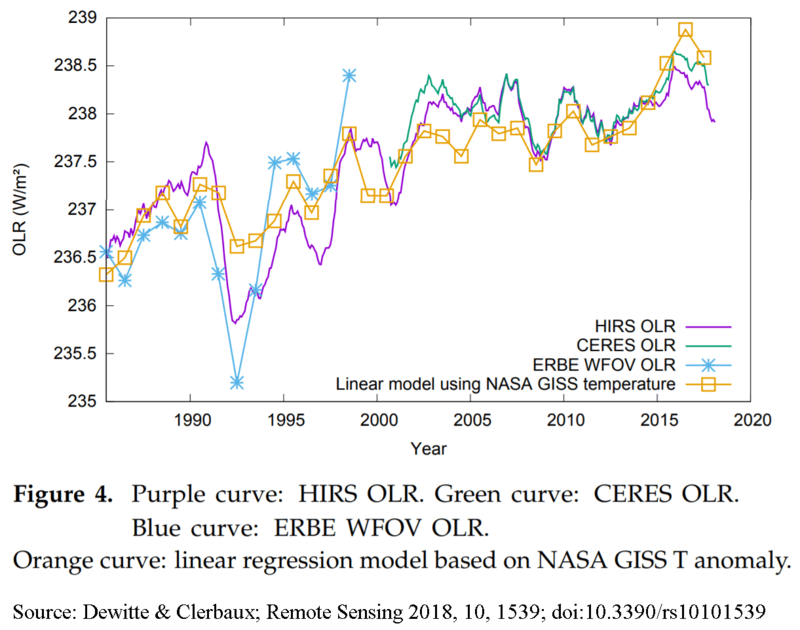 The source of my image is: Dewitter & Clerbaux; Remote Sensing 2018, 10, 1539; doi:10.3390/rs10101539 It plots 4 OLR sources, 3 fully and 1 partly over the past 33 years. It shows 2W/m² more OLR today than in 1985. I noticed both replies ignored my 3rd question, which I shall copy in again (because it is short). What are the magnitudes of surface warming due to downwelling longwave infrared (LWIR) "forcing". Per material, especially, most especially, for water? Because water covers 71% of earth's surface, and LWIR penetrates mere micrometres into water. Has any experiment ever been done to discover the hypothetical warming of water? Some scientists told me downwelling LWIR will only produce a warm skin; that much of the heat from that skin goes into latent heat of vapourization, LHV, which evaporates water. So taking energy from the ocean up kilometres into the air by convective cooling. Other scientists say that "downwelling LWIR warms the surface". They do not distinguish types of surface. Which group of scientists are you with and what is your evidence? You can just cite the paper which observed the effect of, say 2W/m² downwelling LWIR on water. That should be a doddle for you - given the billions in funding spent on climate research over the past 30 years. I've asked other scientists and they just ghost me. It's as if they have no data. If you, yourself cannot find observations or experiments on the precise warming of water by downwelling LWIR, can you, at least, have the decency to admit it? Rather than saying: "Do your own research". I have neither the skills nor the equipment to do this. I did not answer the third question because I do not know the answer. I wish this data went back further (like to 1900), but of course it can't. If the river is in equilibrium, then the volume of water that flows per second must be the same at every point along the river. If 10 m3 of water per second is moving from A to B, then there must also be 10 m3 of water per second is moving from B to C and same for C to D. The cross-sectional area (depth if width is constant) of the river doesn't have to be the same everywhere, and the actual velocity of the water doesn't have to be the same everywhere, but their product does for it to be in equilibrium. Let us say there is a waterfall at point B, and the river is in equilibrium. Then I begin to erect a dam at point C, laying one row of cinder blocks at a time. Let us consider what happens to the flow rate, depth, and velocity of the water at each of the sections. As long as the waterfall is sufficiently high, nothing that happens after (below) it will influence anything before it, so the flow, depth and velocity of the river in the AB section remains constant (yay!). As each successive block is laid into the river at point C, equilibrium is disrupted (temporarily). Flow of water from BC to CD is reduced slightly, which causes the water to well up just before the blockage, increasing the depth in BC. But as soon as the depth is sufficient to overtop the dam, the flow rate in CD picks up again, and equilibrium is reestablished. However, our partially dammed river is different from the starting case. Even though the flow rate in the equilibrium case is identical (flow rate in AB is unchanged, so if new BC and new CD are in equilibrium with AB, they must have returned to their original flow rates). But the depth of BC has increased, and the velocity has decreased accordingly. If new bricks continue laid before equilibrium is established, then, after a certain point (missing the initial decrease in flow) it will look like the flow rate in CD is monotonically increasing (returning to original) AND the depth in BC is monotonically increasing. Now, we can convert this allegory to the relevant topic by changing "water" to "energy." AB is the flow of energy from sun to earth, BC is energy flow within earth, and CD is energy flow away from earth. The depth increase observed in BC is representative of stored (thermal) energy. As the surface becomes hotter, it radiates more, becoming capable of overcoming the additional resistance to flow, but there is still a reservoir building. Has any experiment ever been done to discover the hypothetical warming of water? Yes. Sea surface temperatures are increasing, and coral bleaching is increasing (even faster in 2019 if El Nino predictions are correct). Heat travels more than just micrometers into the worlds oceans. - Water is turbulent, leading to mixing of the surface and deeper layers. - On larger scales, surface layers descend at the poles, hiding a century of warmer waters in the deep ocean. This is only now being explored with autonomous underwater vehicles that can sample ocean temperatures at different depths. James Hansen's 2011 description of the GHGE clearly says that more CO2, absorbs more outgoing longwave radiation, OLR, so less OLR is emitted to space, leading to an energy imbalance causing climate warming. This is not just a sentence in English. It is core to how climate models work. He is wrong. Over 33 years, since 1985, OLR emitted to space increased. Showing exactly the opposite of the GHGE hypothesis predictions. So the central climate GHGE model is wrong. It is not co2 as is claimed. The most prevalent gas is h20 vapour. Increaced air temperature has led to increaced evapouration, this in turn leads to more trapped heat etc. The biggest problem is that when we can no longer sustain heating of the environment with fossil fuels, the temperature will crash, iceage will ensue. The climate will once again recover, but it is on a timescale outside the human ability to outlive. How do we know that the "laws" of physics are really laws, i.e. true everywhere? Why has the physics forum got sexier topics than the chemistry forum? The expression "A moment in time" does it exist in physics? What is dark matter and what is its effect on matter? Page created in 0.188 seconds with 64 queries.